Good thing we got this monster off the street. 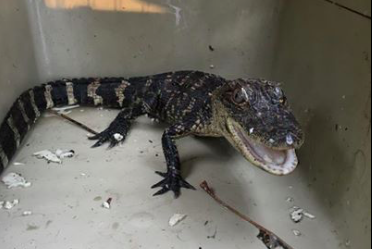 The Pennsylvania Society for the Prevention of Cruelty to Animals will investigate a Snapchat video in which baby alligators were forced to smoke cigarettes and drink from a liquor bottle, the organization announced Tuesday. Authorities caught wind of the video when several outraged FOX29 viewers passed it along to the station, claiming it was filmed in the basement of a home in Bustleton. One of the individuals in the video, a source said, is the son of a Philadelphia detective. Comments from the video suggest it was produced with viral ambitions in mind. One of the men reportedly tweeted, "How are me and my friends not internet famous yet?" A PSPCA representative told FOX29 humane law enforcement officers have seen an uptick in animal cruelty cases in part because social media provides a platform to exploit the animals for attention. The case remains under investigation and no charges have been filed at this time.